Duel to the Death: Two Soldiers from a French and German Patrol at Hand to Hand Fighting - full front page from a drawing by Georges Scott. Map: Indicating Sollum Western Egypt Where Fighting with the Senussi Took Place Along the Suez Canal. Australian Troops o Parade near Cairo. British and Australina Officers Holding a meeting in the Desert of Western Egypt. Camels Arriving at the Western Frontier in Egypt. An Elevated German Machine Gun in Action in Flanders. Flight Com. R. J. Bone Who rought Down a German Plane. Duke of Westminster with the Duke of Marlborough. Wounded Hussar Saves Officer in Wheelbarrow: Private G. Ingle Wounded in the Head Pushing the Severely Wounded Lieutenant Radclyffe to Safety, but Under Heavy Fire - fp from a drawing. General Mahon Outside his HQ. Donkey and Cart Transporting Slightly Wounded Soldiers to Dressing Station. Supplies of Ammunition at a French Depot near Salonika. British Sea Plane About to Land in the Bay of Salonika. 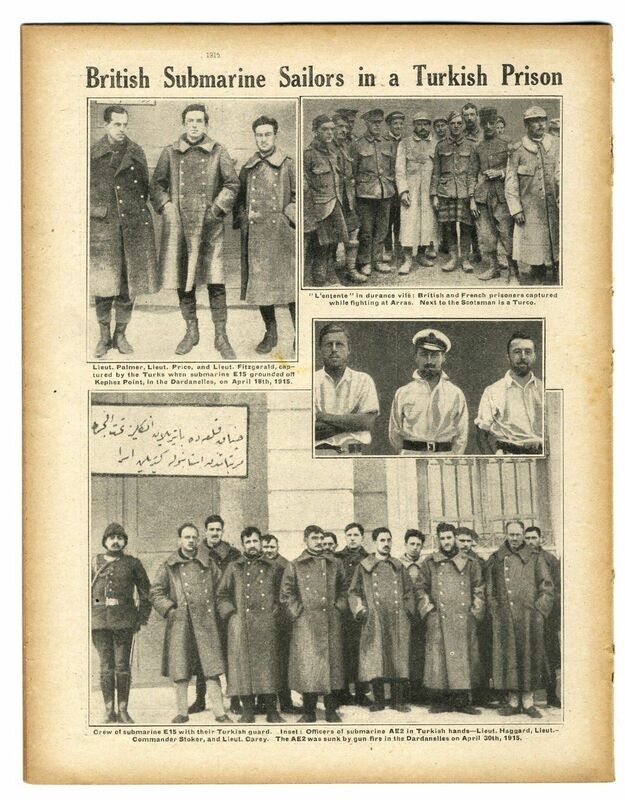 Types of German Prisoners Captured at Verdun. Artillery Horse Tethered to a Post; Its Riders and His Comrades Killed in The Verdun Assault. General Joffre on the Outskirts of Verdun. General Pertain in a Fur Coat, With other Officers. A Dog Kennelled Near a Dug Out on a Front Line French Trench; The Gas Bell in the Foreground . Caves Uses as A Red Cross Dressing Station. Verdun: Snow in the Vosges Woods; Chasseurs Alpins in the Foregound. Initial Work for Construction of a Light Railway Through a French Wood. The Italian Front: Infantry Repulsing an Austrian Detachment on a Snowy Mountain - half page (hp) from a drawing . Alpini Lasoo an Austrian Mitralleuse Gunner. 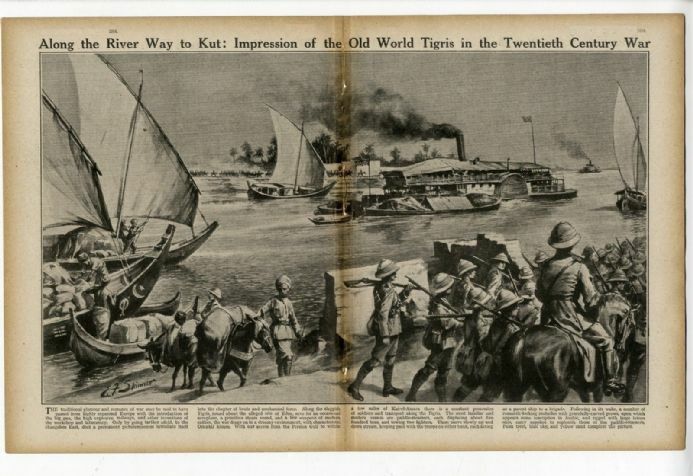 Along the River Tigris to Kut - a wonderful double page from a drawing by E.F. Skinner showing the activity and troop movements o the river. A paddle steamer is seen alongside traditional sailing craft. Portugal in Arms - fp showing x5pics. Of sailors and soldiers. 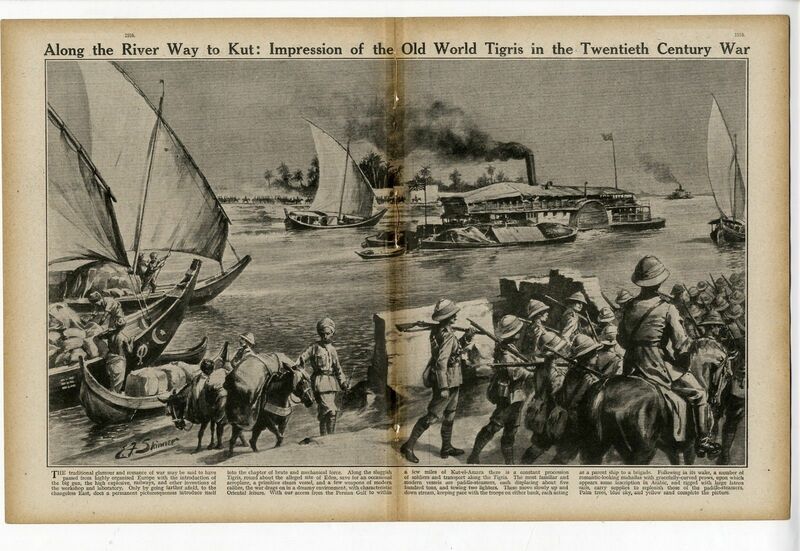 British Troops on an Armoured Barge on River in East Africa. Native Stretcher Bearers and Riflemen of the King African Rifles at Lake Tanganyika. NOvel Form of Locomotion by British Officers on E. African Railway Lines. KAR Awaiting Prisoners on the Beach of Lake Tanganyika. Little Waif Found Straying near a British Camp in France and Adopted by Our Men - child. British Soldiers Assisting Red Cross Nurses to Distribute Supplies. Lighting the Fuse of a Catapult Grenade. Firing Rifle Grenade at a Bomb Throwing School in England. In Training: Making Ready to Rush Trench with Bayonets and Bombs. Two Recruits Practice Grenade Throwing.Sleekburnc. German Rear Admiral Eduard Capelle . An Air Vessel Ascends from a Ship of the Sea - fp; showing x4pics. Captain Arthur Frank Henty - 11th Middx Regt. Lieutenant A. A. Ferguson - 7th London Regt. Lieut. And Adjt. G. R. Frere - 10th Rifle Brigade. Lt. Col. F. E. Daniell DSO - Seaforth Highlanders. Lt. R. A. S. Dobbin - Royal Garrison Artillery. Lt. A. Y. Young-James - 8th hants Regt. Sec. Lt. T. Bell - 9th Black Watch. Lt. G. E. Bradstreet - Royal Engineers. Lt. M. H. C. Firmin - 1st Loyal North Lancs Regt. Lt. A. W. Lane-Joynt - Motor Machine Gun Service. Lt. G. Jackson - 11th Argyll and Sutherland Highlanders. Lt. R. N. Somerville - Royal Engineers. Lt A. L. H. Jacob - 18th London Regt. Lt. A. J. W. Blake - 5th Connaught Rangers. Lt Surgeon P. J. Walsh RAMC. Sec. Lt. M. McGregor - 2nd Cheshire Regt. Lt. G. G. Downes - 6th Lincoln Regt. Sec. Lt. W. L. Orr - 2nd Royal Irish Rifles. Lt. V. B. Odhams - 15th Durham Light Infantry. Lt the Hon. George Joachim Goschen - 5th Buffs. Lt. W. N. Monteith - 2nd Rifle Brigade. French Heavy Artillery: 155 (6in) Gun at Verdun - fp. Lt Palmer Lt Price and Lt. Fitzgerald Captured by the Turks When Submarine E15 Grounded off Kephez Point, Dardanelles. British And French Prisoners Captured While Fighting at Arras. Crew of Submarine E15 With Their Turkish Guard. Lt. Haggard, Lt Commander Stoker, and Lt Carey. Public Amusements by Oswald Stoll; theatre etc. Medical Science by Stephen Paget. Chemistry by Sir William Crookes. Will Crime Diminish by sir Robert Anderson. The Drama (theatre) by H. B. Irving. Article by Carlyon Bellairs RN on the German Navy etc. If there is a particular date you require in regards to this item eg. for a Birthday or anniversary etc please ask. This magazine is an original and used issue, not printed on the best of quality paper, but it more than makes up for this in terms of written content with many images. The four digit number in brackets in title is for my ref only. It measures 285mmx220mm (11.25 x 8.5 inches) approx. There are binding witness marks on the spine where once bound. There is age yellowing and spotting/foxing and some marking. There are handling marks to the edges. The photographic images, sketches etc. vary in size. PLEASE NOTE: I cannot guarantee that the issue is complete 'as published' - but what I have described above IS present. As far as I can tell there are no pages missing, but if you are looking for something in particular in this issue PLEASE ASK. If you require information on size of articles (i.e. number of words), sizes of images, please ask before bidding or buying. This item will be packaged in a board backed envelope. The descriptive text in my listing, details the content in my words and not necessarily what is written on the original page. "Info." in the description is my research, although relevant to the accompanying image or article, is not necessarily in the text. Antique and Vintage Prints, Maps & Ephemera - Newspapers, Magazines & Books.